OH HOT DAMN I want to eat that. 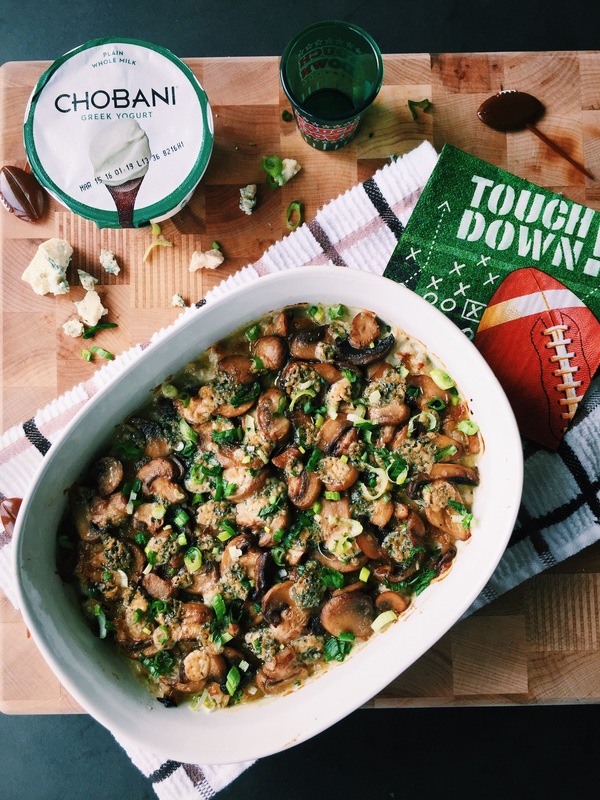 I’ve partnered with Chobani to create some delicious recipes for the big game, and this one really knocks it out of the park. Or…kicks it into a field goal. Yes…that makes more sense here. 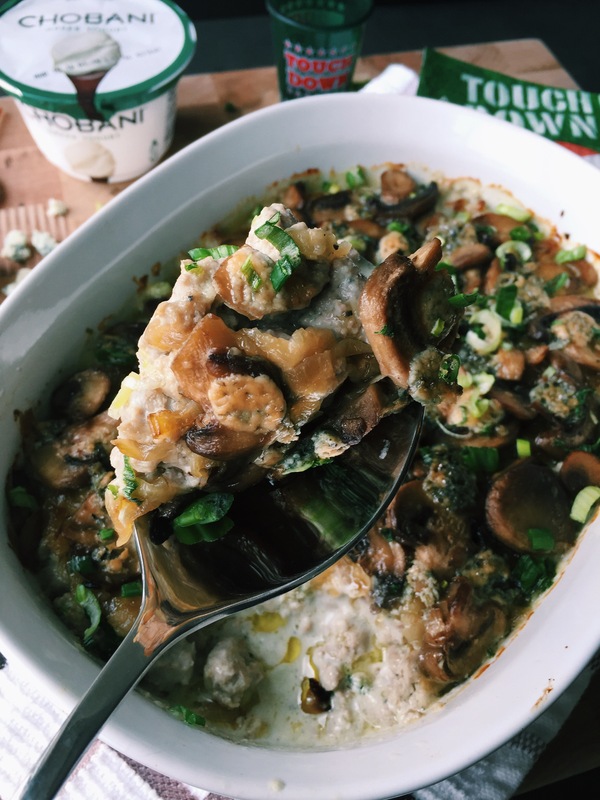 I made this blue cheese burger dip last year, but it was extra fattening with beef, bacon, sour cream, cream cheese, etc…it was delicious, but heavy AF. When I’m cooking/entertaining, I like to mix things up between somewhat healthy and extremely fat. You gotta have a balance, and my balance usually includes bacon. That said, a lot of my friends don’t eat the Skinny Pig way, so I partnered with Chobani to lighten this one up a bit. The result? STILL SPOT ON. I had some friends try it and they had no idea it was made primarily with YOGURT and ground turkey. I will always miss bacon when it’s not around, but you can always add that in if you really want to. Far be it from me to stop you from adding bacon. Also the blue cheese sauce. Can we talk about that? Because it’s kind of amazing. I would make this and keep it around in a jar if I could. OH WAIT I CAN. AND SO CAN YOU! Exciting times guys, exciting times. AND it’s not as bad for you as a tub of blue cheese dip made with sour cream. EVERYBODY WINS IN THIS GAME BECAUSE IT’S #MADEWITHCHOBANI. Thanks again to Chobani for working with me, and head on over to MadeWithChobani.com to see more recipes! Make the caramelized onions. Heat olive oil and butter in a nonstick pan over medium-low heat. Add the onions and sauté, stirring often until they become translucent, about 15 minutes. Add 1/4 tsp of salt. Continue to stir and cook for another 10-15 minutes until they start to become very soft and slightly brown. Add in the 1/4 tsp of sugar and cook for another 10 minutes. At this point the onions should be golden brown. Add 3 tbsp water to deglaze the pan. Scrape up any brown bits on the bottom in until the onions start to look jammy and smell sweet. Remove from pan and set aside. This entire process takes 45 mins – 1 hour. Do some squats while they’re cooking. Seriously, I do that. In the same pan, add 2 tbsp olive oil and raise heat to medium-high. Add the mushrooms and cook until softened and cooked through. Add a pinch of salt and pepper. Remove from pan and set aside. Make the blue cheese sauce. In a medium bowl, add the Chobani, cream cheese, mayo, garlic, lemon juice, Worcestershire, mustard powder, salt and pepper. Stir to combine. Add the blue cheese and fold in. Using the same pan over medium high heat, add the ground turkey. Cook until there is no more pink showing through. Add ¼ tsp Kosher salt and a pinch of black pepper. Add the cooked meat to the blue cheese mixture and stir together in a bowl. Assemble the dip. 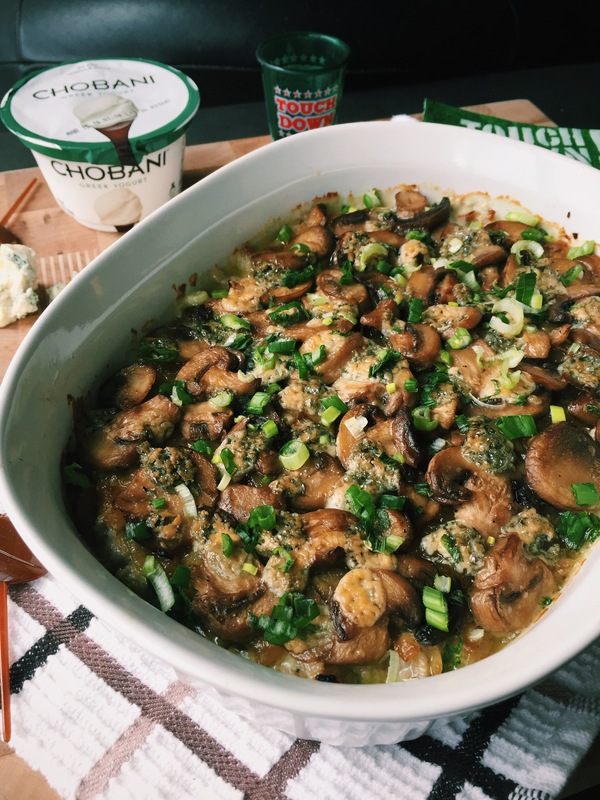 In a 5 x 7 small casserole dish, add the meat and blue cheese mixture and spread evenly in the dish. 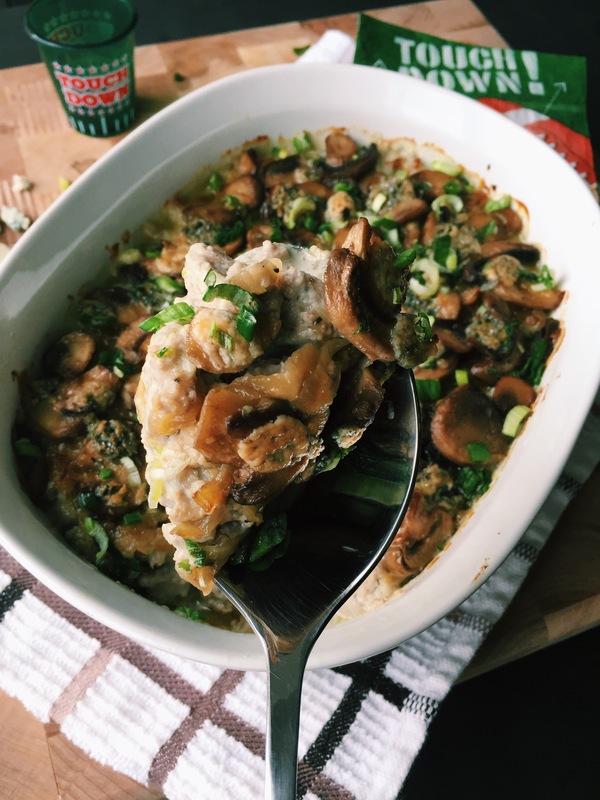 Top with the caramelized onions, then the mushrooms, and top with some more blue cheese crumbles. Cover and bake at 350 for 15 minutes. Remove the cover and broil for 10 minutes or so until the cheese gets a little browned, but be careful not to burn! 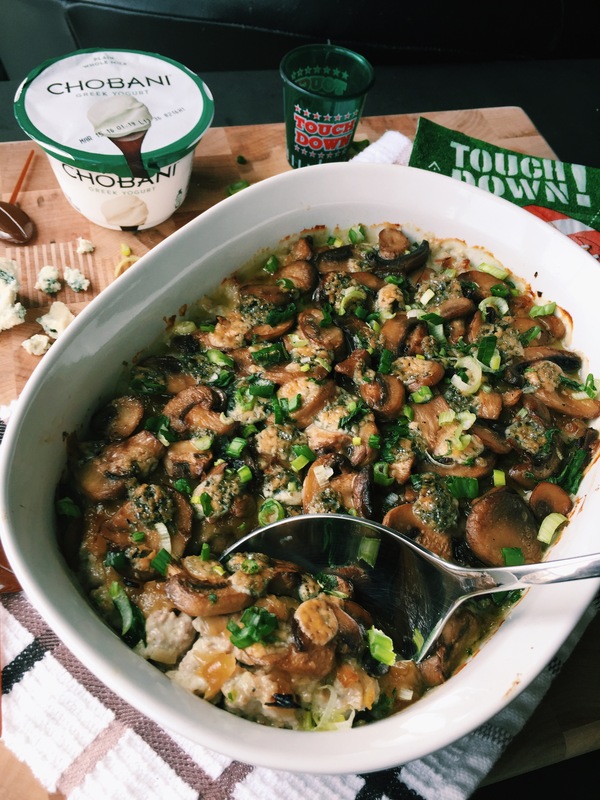 This post and recipe was created in partnership with Chobani. Remember, The Skinny Pig doesn’t work with any company she doesn’t like. She’s picky that way.